My previous post has most of the details on pattern and stuff of these socks, but I'm pretty proud of myself. I was using the stuff I picked up from Simple Socks Plain and Fancy, which is really an excellent book. Totally worth it, and it has a lot of information on estimating sock sizes based on just 1 or 2 measurements! And Mittens too! Plus, she totally advocates toe up socks, which are my FAVORITE. Anyway, I'm only a little way through the toe of teh second sock but I'm just busy doing stuff for and an Etsy secret santa. I made this a while ago.. But I just got around to taking photos now that I have a dress form. It is made from a kit I got from some place in australia, but I'll be damned if I can remember where the website was... Anyway, it was expensive and it came with like 20+ skeins of yarn all perfectly dyed and it knitted into this huge wrap that is like.. 9 feet long, I swear. Its so good. Its scratchy but it's really pretty so I don't care. Nothing beats a rainbow. TRULY. Rainbows make you feel happy. And just in case you're wondering about the sudden rash of posts, its because of susan. She has inspired me. I need to find all my damned books so I can get knitting.. I think my copy of A Gathering of Lace and my Knitting over/on the edge books are all still back in New York. GRR! Also, I purchased a pattern for the Heere bee Dragone shawl. It's got a weird name but isn't it gorgeous? I'm excited to start it but I'm hoping that my secret pal sends me the perfect silk or silk/wool blend yarn for it. MMM. So, yesterday was a rather slow, enjoyable day. Lots of crafty ladies over here at N.E.W. but it's all very "Kountry Kraft Korner" here, which makes it hard for me, being the ivy-league educated "hip" twenty-something that I am. Hard to listen to Big Butch Lesbian Lady talk about how HORRIBLY overpriced the local yarn store is and extolling the virtues of the "Pound of Love" yarn you can buy at Walmart on sale at this one certain time of year. Ugh. Expand your horizons and realize that sometimes yarn is expensive because it is nice. Don't misunderstand- I don't see anything wrong with shopping for cheap acrylic yarn at walmart- I think that cheap acrylic yarn has its place in the world, but talking down about the Local Yarn Store Owner because her stuff is "overpriced" is just close-minded, in my thinking. On top of all that, I haven't seen anything remotely "nice" from any of the ladies around here, unless you like garbage bag holders and novelty yarn scarves, but nothing that is remotely "hip" or even traditional- its all tacky "krafts." It's very uninspiring- I miss being around craftspeople who made things other than fun fur flip flops and furry scarves. Seriously people, there's a whole other world out there, one where plastic canvas is recongized for the tacky travesty it is and where there are yarns beyond Red Heart Super Saver and Caron Simply Soft. There is a world of traditional knitting, lace and fair isle and loveliness, a world where legwarmers and armwarmers are made from deliciously soft merino wool hand-dyed by people just like you and me. There's a world where socks are like butter on your feet. There's a world where super-detailed counted cross stitch patterns look all the world like stitched paintings of landscapes and animals, a world devoid of cute little teddy bears and tacky 'homemade' looking things. A world where cabled sweaters are made by people and not bought at Old Navy. Am I snobby for feeling this way? I don't really feel that I'm being snobby but for gods sake people there's more to the world than garter stitch fuzzy scarves and those stupid no-sew fleece blankets! Dammit! Yarn doesn't have to be made out of plastic! And for god sakes Montana, there is a world where cheddar cheese is not dark orange. I started making some socks, these spiral socks using Koigu Painters Pallette Premium Merino and some KnitPicks Gloss. The gloss is so I can get a full pair of socks out of 1 skein of Koigu. Yum. They are super soft too because not only is the Koigu super yummy, the gloss is soft so these socks are gonna be heaven on my feet. I'm sooo excited. I'll post pictures when I get a chance but they look totally rocking, the Koigu is pink and orange and the gloss is black so its a really great effect. Luff it. 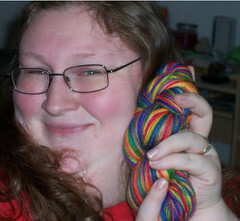 I finally found it- the PERFECT rainbow yarn. If you've read my blog for any amount of time you may know that I've been on a mission to find the perfect rainbow-colored yarn for quite some time. In fact, I've failed many times- and the suggestions people give me are always "red Heart mexicana!" which doesn't have the right colors or "Bernat Hot Sox!" which, well, doesn't come in a decent fiber. But at last, thanks to LavenderSheep on Etsy I have found the perfect yarn, and this yarn is going to be an awesome pair of socks that will be mine... alllll miiiine.